Let me say Cruelty to Innocents is not a very long book but it is long enough to knock your socks off! Imagine you are out with your children and see an accident, a person having a heart attack or any person needing help, you stop to help help them. When the ambulance and police arrive you go back to your child only to find them gone! Disappeared into thin air. You did a good deed and now your child has been taken by some sicko. Can you imagine how you would feel, what would be going through your head, the guilt that would be there for leaving them to help another? That is what this book is about. Children being abducted from their parents who are helping others. I love, love, love the characters in the book. Sloanne is an amazing woman who faces her demons by going back to Aberdeen Maryland, a place she left and had no intentions of returning to. She does, to help her best friend,Chloe, find her missing daughter, Danni who is also Sloanne's god-daughter. Once back she pairs up with Shawn Tyler, a local fireman an old school acquaintance. The two of them together are such fun to follow as they do everything they can go find the missing girl. Sloanne and Shawn are two people that I would love to have as neighbors! 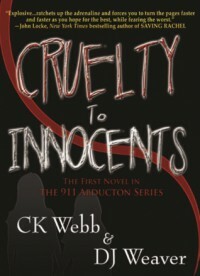 Twists and turns aplenty in Cruelty to Innocents. It will have you up well into the wee hours turning pages and wanting more. I was floored by the ending and never suspected what was coming. CK Webb and DJ Weaver are authors you don't want to miss. If you love suspense hurry up and grab this book. Highly recommended.